Mother’s Day is the one day of the year where you get to spoil your mum and show her how much you love her, and how much you appreciate what she does for you on the other 364 days. This year, instead of buying her a bunch of flowers that will fade before the week is out, why not give her a gift that keeps on giving? It sounds corny I know. But your mum is the most important person in your life, so show her how much you care by introducing her to essential oils, and Young Living. Introduce her to something that will change her life for the better, and yours too. This page is for UK Residents. If you are in the USA or Canada please read this instead. What can my mum do with these oils? Lavender essential oil – oh so many uses, they don’t call this the swiss army knife of oils for nothing! Dried chapped hands, paper cuts, screaming children, bumps and bruises… when any of these things happen I reach for the lavender. Thieves essential oil – named after a group of men who stole from the bodies of plague victims and did not get sick. Colds and flu, warding off germs, sore throats, cleaning the house – all good times to crack open the Thieves! Peace and Calming – does what it says on the bottle. I diffused this one day to try and calm my children when they were screaming and I very nearly fell asleep! Now I use it in their bedrooms at night. Panaway, valor and peppermint – this is my go to combination when I have discomfort in my spine (I have osteoporosis and fractured several vertebra), I feel so much better putting oils on my skin than swallowing pills! And here are some more ways you can use those 10 cute little bottles! What kit do you recommend for mum to get started with? 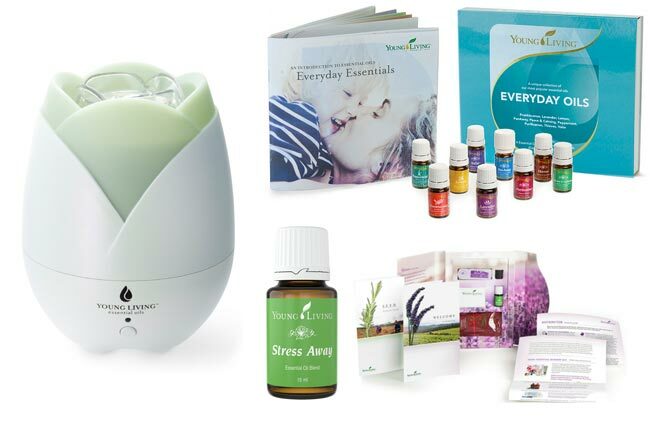 When my friends introduced me to Young Living they suggested I start out with the Premium Starter Kit, and I’d say that it would be the best way for your mum to get started too. It has everything she needs from the set of Everyday Oils to the all important diffuser. It’s the most cost effective way to get started too! First up mum will get a set of 9 Everyday Oils, and a bottle of Stress Away. 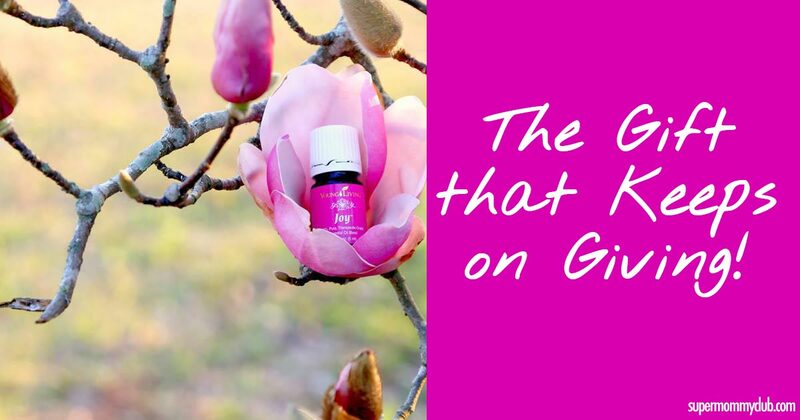 And she’ll also receive some samples that she can share with her friends, because trust me as soon as she gets started with these oils she will want to tell her friends about them too! But that’s not all. She’ll also get a gorgeous Home Diffuser which is such a great way to experience all the goodness of those essential oils. AND her wholesale membership means she can save 24% on all of your future purchases! Please note if you live in the US, Canada or elsewhere in the world your Premium Starter Kit may contain slightly different items. You can click here and select your country to see what will be included in your kit. Hang on, you just said membership. Is there a monthly minimum order? Nope, the benefit of your mum joining Young Living as a wholesale member is that she gets to save 24% on all future purchases. But she doesn’t have to order something every month. She just needs to spend a minimum of 50PV (give or take £50) each year to keep her membership open. Oh and she doesn’t have to sell the oils either, though if she introduces her friends to Young Living they’ll send her some money as a thank you. My mum doesn’t know anything about oils though. How will she know what to do? Don’t worry, when I signed up I was clueless about oils too! But it was all fine because I was invited to join an AMAZING Facebook group where I could ask all the questions I wanted, and your mum will receive an invitation to join too. This sounds like a great gift for my mum. What do I do now? Click on the button to start the enrolment process. The application form will open in a new browser window so you can refer to the steps below to help guide you through the process. Click here to open the application form. Select your country of residence from the drop down box. The “sponsor ID” and “enroller id” should be pre-filled with 2398962, if not please type that number into both boxes. Make a note of your username and PIN because you will need that in the future. Now you need to select your starter kit. If you want the kit I’ve talked about above you need to select the Premium Starter Kit. You’ll be asked if you want to sign up for Essential Rewards. This is a great way to get even more value out of your oil purchases but you don’t need to join today so feel free to select no. We’ll tell you more about Essential Rewards once you’ve had a chance to experience the oils in your kit. Click Next once you’ve completed the form. If you want to add anything else to your order you can do that on the next page, but again you don’t need to do that right now. Complete your check our and you are all done! Did the screen go blank when you hit submit? Complete your checkout. You’re all done!